Do you have questions about Georgia O'Keeffe, where she lived, or where she painted in Northern New Mexico? Send your inquiries to okeeffecountry@gmail.com. We'll do our best to answer them and post the responses here. You can comment on your own experiences in O'Keeffe Country here. "We will be visiting Santa Fe, New Mexico, in the summer. We would like to see places in the area where Georgia O’Keeffe lived, stayed, and painted. Can you give us some suggestions? Thank you for your help." What a wonderful way to experience “O’Keeffe Country” – in person. We have several recommendations for you, all of which require the use of a car. Some require reservations too, so it is nice that you are planning this far in advance. Santa Fe – The Georgia O’Keeffe Museum is located in Santa Fe, three blocks southwest of the central plaza downtown, at 217 Johnson Street. The Museum, which celebrates its 15th anniversary this year, is dedicated to the artistic legacy of Georgia O’Keeffe, to defining its ongoing significance, and to the study and interpretation of American Modernism (1890–present). The Museum owns more than 3,000 artworks, photographs, and archives, as well as O’Keeffe’s homes in Abiquiu and Ghost Ranch. The total collection establishes the Museum as the single most important and comprehensive repository of O’Keeffe’s drawings, paintings, sculptures, and related materials. Throughout the year, visitors can see a changing selection of these works, and you can find their upcoming exhibition schedule on their website under “ART/EXHIBITIONS.” No reservations are required. They are open 7 days a week, 10 AM – 5 PM, and are open late on Friday evenings until 7 PM. The Santa Fe home she lived in from 1984 - 1986 (when she died) is called the Sol y Sombra Estate, located at 4018 Old Santa Fe Trail, and is now owned by Microsoft founder Paul Allen. 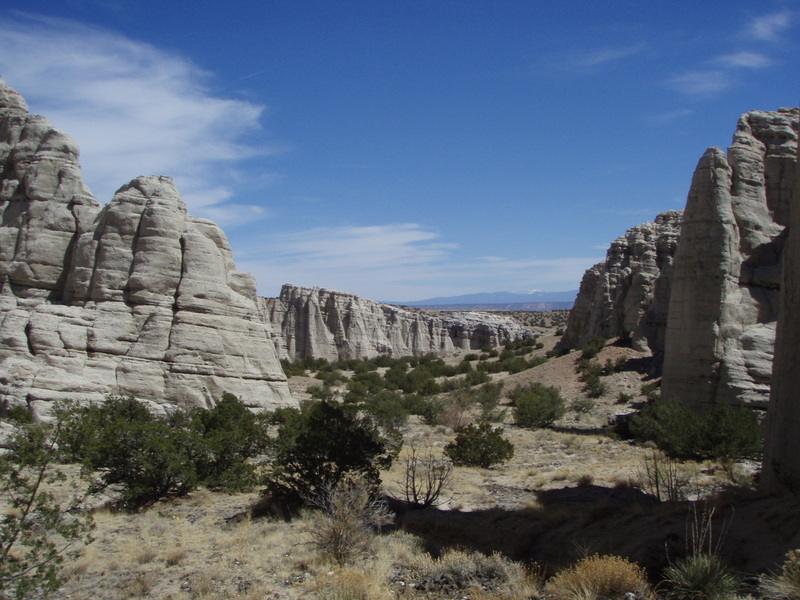 Abiquiu – Approximately 45 minutes north of Santa Fe is the village of Abiquiu. O’Keeffe’s home and studio, adjacent to the main plaza, is open to the public for tours from March through November. The house has been preserved almost exactly as she left it. Even the “Beware of Dog” signs still hang on the fence. You must make a reservation in advance, as space is limited. You can do this online or by calling (505) 685-4539. Please do not drive to the house. It is gated and secured, and you will be denied access. Instead, you are required to meet your guide at our tour office, next to the Abiquiu Inn, and we will drive you to the house in a small bus. Note that the village and plaza are private property. We ask you to please respect the rights and privacy of the village residents. There are no businesses on the plaza, and no bathroom facilities, so please do not approach people’s homes. We appreciate your cooperation in abiding by the rules and laws of the village. The Black Place - Located in the Bisti Badlands in Navajo country, about 150 miles northwest of Ghost Ranch, “the Black Place” as O’Keeffe named it, is a stretch of desolate black, grey and silver hills and arroyos. This was one of her favorite painting sites and it is extremely isolated, away from the main road and civilization. O'Keeffe camped there often, and she created several paintings, sketches, and photographs of the area. To get there from Abiquiu, take NM 96 W and then S to US 550. Proceed west on US 550 through the town of Counselor. The Black Place is at mile marker 111, on both sides of the highway. If you're planning on parking your car to take photos or walk around, use caution - there is no designated parking area, only the road's shoulder. Taos – Although O’Keeffe never lived in Taos, she did visit there several times, staying with her friend, and socialite, Mabel Dodge Luhan. She met Mabel at Alfred Stieglitz’s 291 Gallery in New York, and Mabel invited her to Taos in the summer of 1929. Mabel, a writer and an influential patron of the arts in her own right, courted a large circle of famous and interesting friends and artists, including D. H. Lawrence, Gertrude Stein, Marsden Hartley, John Marin, and Stuart Davis. Mabel’s house is currently a historic inn, open to the public. 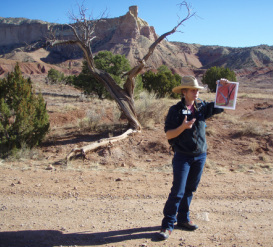 They also provide workshops on the rich history of the area, the Taos Pueblo (which O’Keeffe painted), Mabel’s life and her circle of friends, including O’Keeffe. 1940, Oil on Canvas, 30 x 24 Inches. Courtesy of The Phillips Collection. One mile north of Abiquiu, take a right at County Road 155, and follow the unpaved road for several miles along the Chama river to the Dar-Al-Islam Mosque entrance, on your left. Drive through the overhead gate, follow the road and park at the end circle. Look forward and you simply can’t miss the white cliffs directly ahead of you. 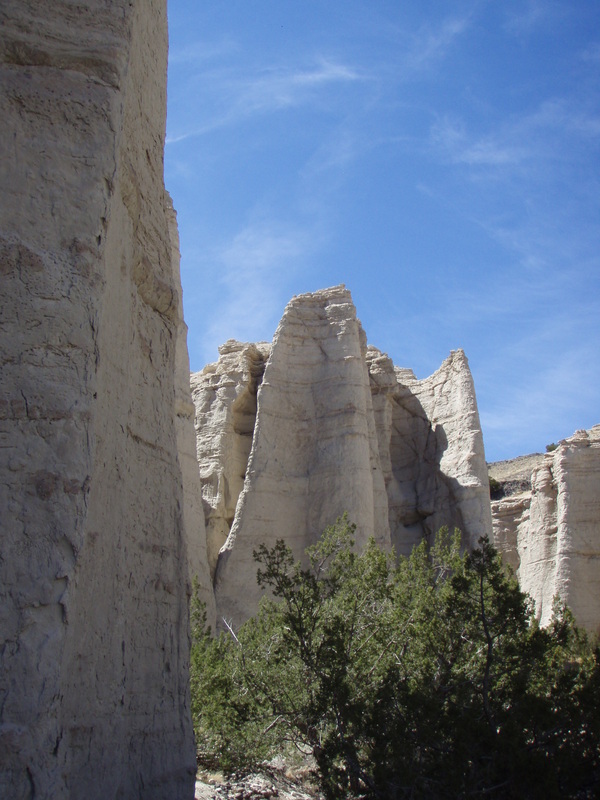 Walk down the hiking trail and you are in Plaza Blanca, The White Place. 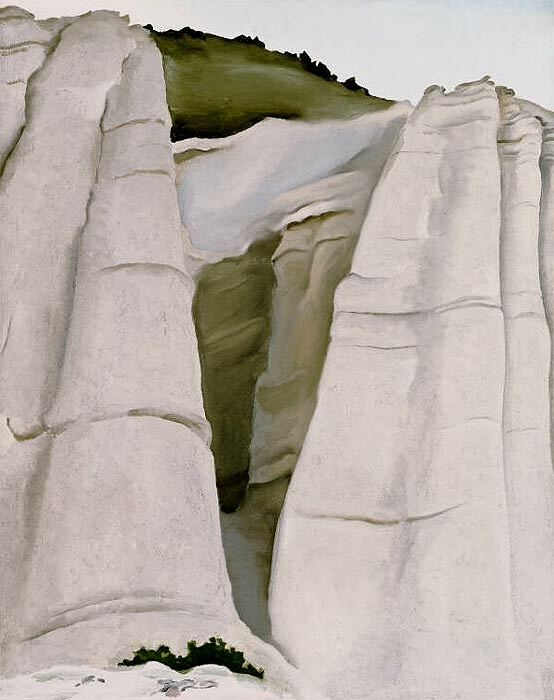 O’Keeffe could see this marvelous canyon from her bedroom and studio windows in Abiquiu, and camped there often, creating iconic images of the stark walls against beautiful blue skies. She loved to hike too. The area is owned by Dar-Al-Islam. No fees or check-ins are necessary, but please be respectful of the fragile environment. Do not take any items from the terrain – except photographs and memories - and leave nothing behind but footprints.